This is how the martial law victims and their relatives expressed their resolve not to allow the resurrection of dark days of martial law. 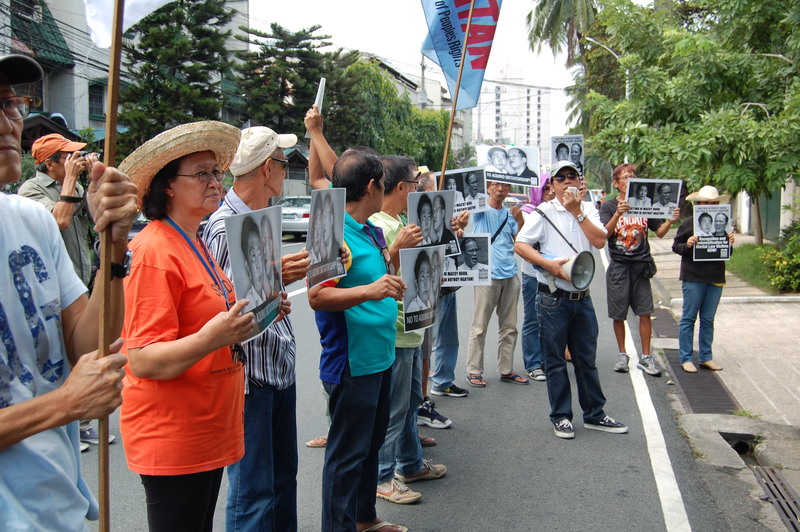 Martial law victims trooped at the Aquino residence in Times Street, Quezon City to remind Pres. 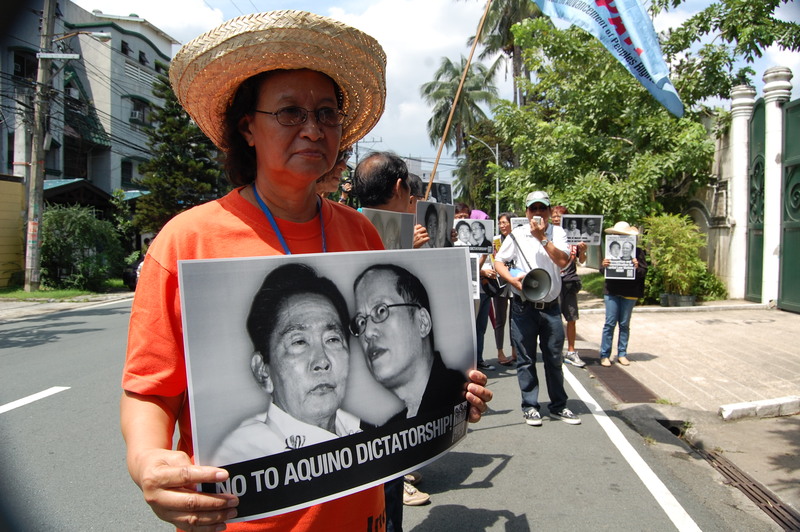 Aquino that it was not just former Sen. Benigno Aquino who fought the former dictator. 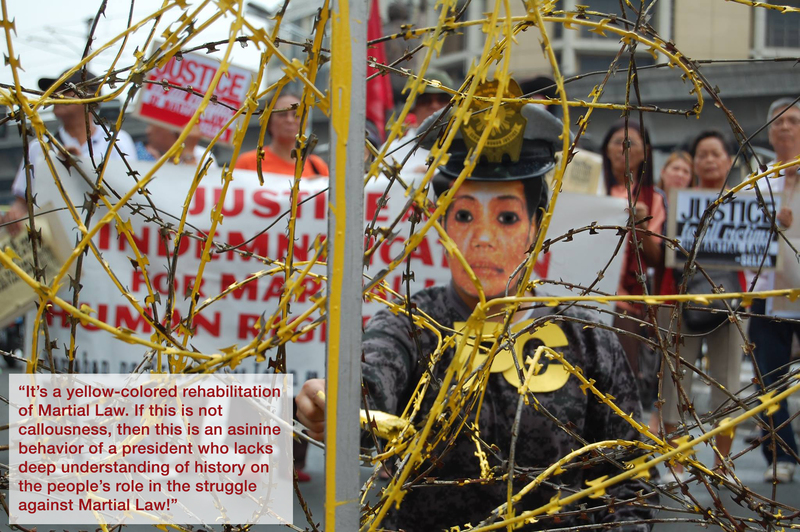 “The Filipino people opposed the fascist, bureaucrat-capitalist and imperialist character the Marcos regime long before the late Sen. Ninoy Aquino was assasinated, and long before martial law was declared,” said Marie Hilao-Enriquez, activist and political prisoner during martial law. “We remain vigilant and defiant to any sitting President who pretends to be ‘pro-people, pro-democracy and patriotic.’” The country’s situation has not significantly changed from the time of former dictator Marcos up to Noynoy Aquino’s administration. The country remains under the shackles of corruption, subservience to U.S. imperialist policies and state repression. Now, Noynoy Aquino wants to perpetuate himself in power by amending the Philippine Constitution and clipping the powers of the judiciary. His regime is set on further selling out the national patrimony. Noynoy Aquino is doing a Marcos,” Enriquez, chairperson of SELDA, said. “Biktima ni Macoy noon! Biktima ni Noynoy ngayon!” This is how the martial law victims describe their situation now with the rigid requirements being asked of them by the BS Aquino’s Human Rights Victims Claims Board (HRVCB). In a press conference today, SELDA chairperson Marie Hilao-Enriquez, martial law victim and daugther of the lead plaintiff vs. Marcos, Trinidad Herrera-Repuno, one of the expert witnesses in the Hawaii Court, and one of delisted victims Dr. Bienvenido Lumbera, National Artist for Literature, expressed their disgust and raise concerns over BS Aquino’s Human Rights Victims Claims Board system of application for reparation and recognition. “I have personally witnessed the process of application in the regions of Panay, Bicol and very recently in Southern Mindanao. It is arbitrary, chaotic, inconsistent and most of all, anti-victim,” said Enriquez. Thus, she announced that she will not be filing for her claim under the law that SELDA fought so hard for to be passed. 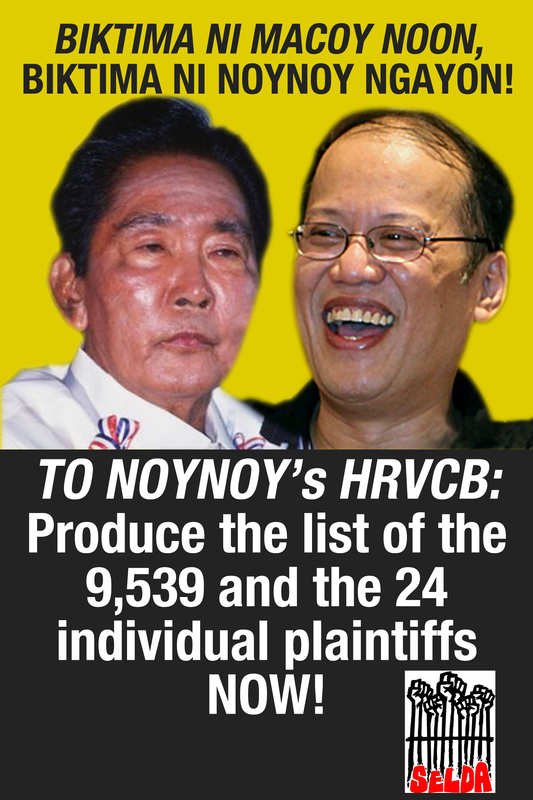 It can be recalled that Pnoy’s-formed HRVCB said they are expecting at least 20,000 applicants. However, during the past three months of regional on-site intake operations conducted by the claims board, they are not thoroughly prepared to receive applications. They didn’t consider what difficulties the martial law victims may encounter who have to travel from the far-flung barrios just to apply personally within the limited days of regional on-site intake operations of the Claims Board. Many of the victims, who come from the sectors of the urban and rural poor, from landless peasants, have to raise money for their transportation and food just to be able to apply for reparation and recognition dispensed by the law or the RA 10368. “The claims board asked for too many requirements from the victims, many of which were outrightly unnecessary and even outrageous. The victims are made to line up without any of the so-called respect that should have been accorded them. Biktima na nga, pinapahirapan pa,” said Enriquez. According to Enriquez, unnecessary requirements include birth certificates from the direct martial law victims, presentation of two government-issued IDs which is not indicated in the claims board application, and original release papers for those illegally detained. “Does the claims board realize that we are talking about martial law, that military power took over civilian institutions? How do you expect the victims, many of them are farmers and ordinary people to acquire such documents? How could they ask for release papers when these were not available amid rampant illegal arrests and detention?” Enriquez added. More than 40 years have passed; more than two thousand victims haven’t had a taste of the indemnification of the settlement agreements in the years 2011 and 2014 as provided for in the Swift-crafted settlement agreements for those included in the Hawaii class action suit. They were delisted from the list based on the so-called “order” of the Hawaii Court that claimants must return to the Court the confirmation form sent in 1993 and 1999. 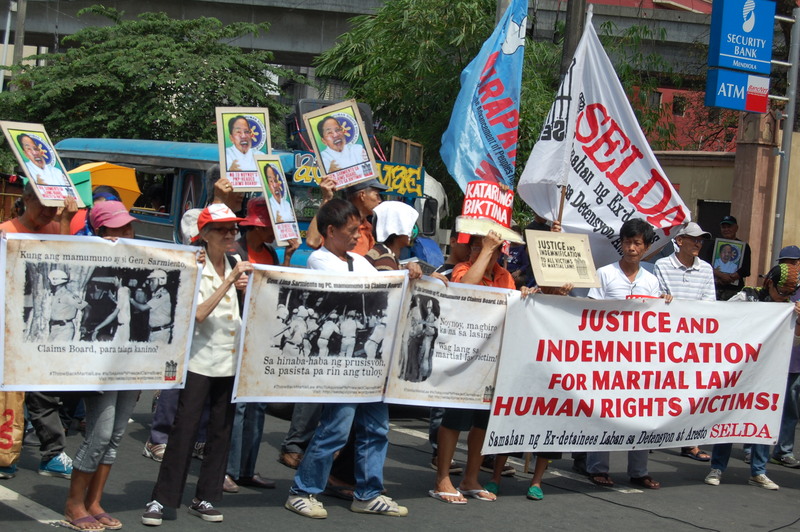 This time, under RA 10368 or the Human Rights Victims Reparation and Recognition Act of 2013, martial law victims demand the claims board to produce the list of 9,539 victims plus 24 direct action plaintiffs for conclusively presumed victims. If the list of conclusively presumed has been produced at the very beginning, class action suit members need not go back to square one in their application for reparation and recognition. They only have to prove their identity.